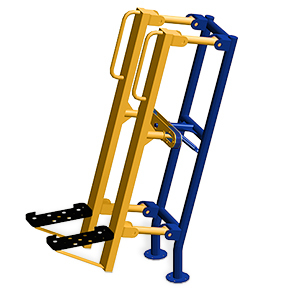 The Stair Climber is an extremely efficient piece of outdoor fitness equipment to implement into your facility. The climbing movement works large muscle groups, which is very beneficial in fat burning. This piece of Outdoor Fitness Equipment sculpts and tones the lower body by working muscles in both up and down directions, creating a much more efficient workout than walking or running. Users utilize their own body weight for resistance, and climbing can be done at various speeds for different cardio levels. The state of the art finishing process used on the Stair Climber combines the application of an 'Electrocoat Zinc Rich Primer' with a durable polyester powder-coat top layer to ensure every crevice and joint is completely sealed, providing full protection against	corrosion and weathering. Stair Climbers are finished in either a gloss or textured polyester powder-coat finish. Crossbar color will be chosen by production supply. 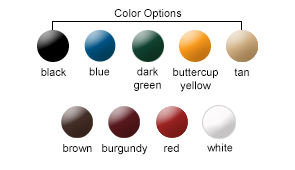 If you have a specific color preference (tan, green, blue, or red) it may increase the lead time. Improves muscular & cardio conditioning. Peak exertion point is reached faster cutting workout times in half. Increases lean muscle tissue to raise the amount of calories burned at rest.